We may not have awakened to a winter wonderland on Christmas morning but as the day progressed, the heavens opened up and unleashed copious amounts of sparkly glitter, and very soon we were blanketed in the festive, white stuff. It’s funny how that on most days, snow is an inconvenience, a mess to drive in and the constant shovelling of driveways and footpaths isn’t the kind of exercise we enjoy on a wintry morning. However, I love it and during the holiday season, so does everyone else. True, driving can be treacherous, it’s freezing and the car never warms up, but I love winter, and I enjoy everything that comes with this season. I would have preferred a more leisurely start to Christmas morning but since we do not partake in the traditional festivities of Christmas, our early start is usually, what has become our tradition now, a harried trip to the theatre to catch the first showing of a film. This year it was “A Night at The Museum 3” I really enjoyed this one because it is set in my hometown of London (and could possibly also, have a lot to do with the fact that Dan Stevens is playing Sir Launcelot). As we left the movie theatre, the blue skies that had accompanied us earlier that morning, had all but disappeared. Muslin like layers of white, wispy clouds, tightly interwoven, were pinned to the once blue sky. The sun lay hidden behind its white veils, nudging the mercury to plummet 20 degrees. We drove home in a popsicle mould that seemed to be happily chilling in a freezer drawer. Back inside the confines of our toasty home, we lit a crackling fire and attended to some slightly, mundane household tasks that needed to be addressed. Christmas movies on the telly, a roaring fire, a belly full of comfort food, and a cup or two of soul soothing tea and I found my eye lids getting heavier by the minute. All in all, it was a day filled with precious family time, good food and snuggle time in front of a very, crackly fire. I hope all of you had a wonderful day as well. What did you all do for Christmas? Unfortunately, in all the lazy hubbub of the day, dessert was sorely neglected. 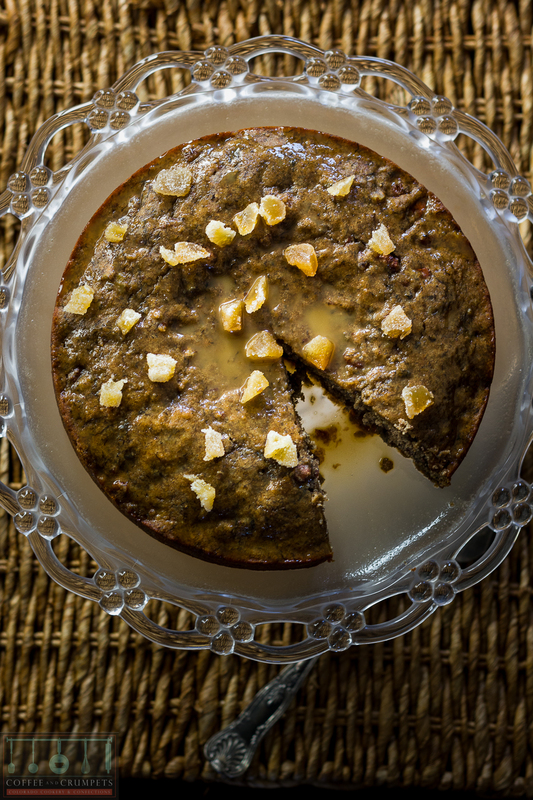 We managed to scrounge up some ice cream and gelato, greedily scraping up every precious spoonful, and some imported English fruit cake to satisfy our cravings but I sure could have managed a slice or two of this very, delectable Roasted Banana Cake. I made this a few weeks ago with some bananas that looked like they were past their prime but on peeling them I discovered they were perfectly ripe. They made an excellent cake. I’m not a big banana muffin, bread or cake fan. I think it’s something to do with the strong ethylene gas/musky aroma that bananas emit. I like bananas just fine to peel and eat, or throw in some ice cream or banana splits but I don’t like them baked into things. I find that cooking them a little bit, gets rid of that strong “fresh banana baked into things” taste. I make crepes with lightly sautéed bananas and I love them. So, with that theory in mind, I figured that if I roasted the bananas, then maybe that taste would not be apparent. I was right. This could be considered an alcohol free Bananas Foster cake, I suppose. When I make my banana crepes, they’re always drizzled with a toffee sauce, as is this cake. 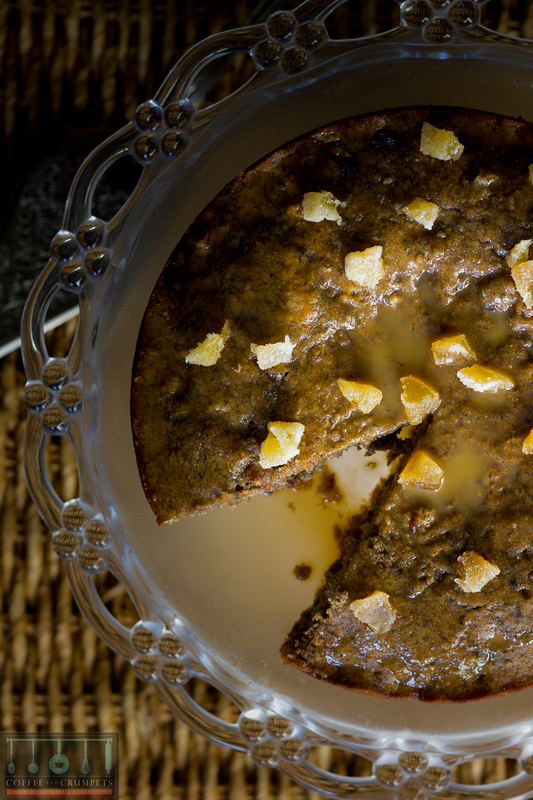 The lovely thing with this cake is that all the toffee sauce gets absorbed into the cake as it sits and this lends great moistness and a melt in your mouth quality. It’s quite the celebratory cake. 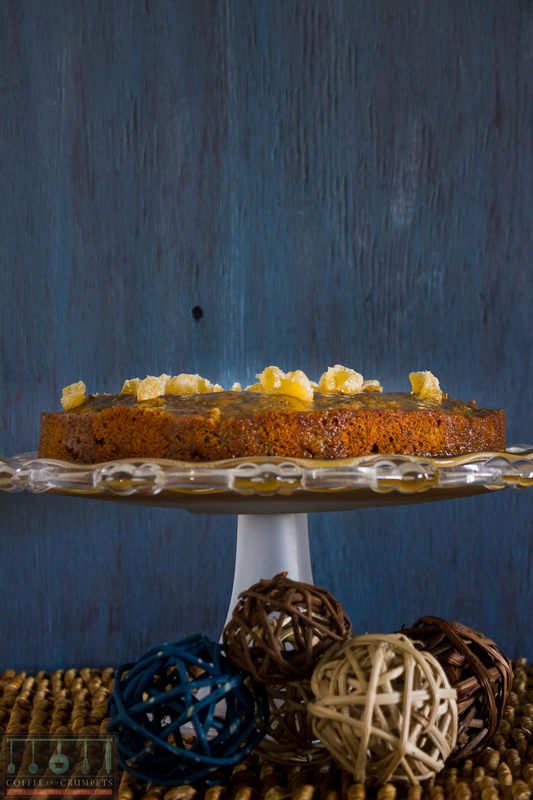 Don’t forget the crystallised ginger on top, it adds a wonderful sharpness to the rich flavour of the cake. Everyone who tasted the cake, loved the ginger. 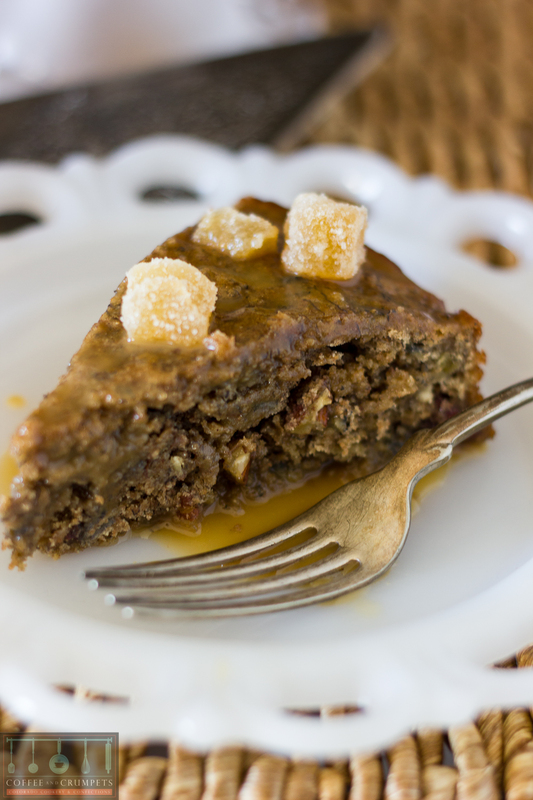 A rich banana cake made with roasted bananas. Peel the bananas and chop them in medium size chunks. Place the butter in a cast iron skillet or oven proof dish and place in the oven to melt. Once the butter is melted, add the chopped bananas and place back in the oven. Roast the bananas for about 20-30 minutes. You want them soft but also tinged with golden brown. While the bananas are roasting, prep the rest of the ingredients. In a large bowl, add the flours, baking powder, salt and cinnamon. In a bowl of a mixer, place the sugar, eggs, and vanilla. This can be done by hand too. Add the flour mixture and then the milk, mix gently. Add the butter and the roasted bananas and mix thoroughly. Add the chopped pecans and mix. Place in the oven and bake until firm and golden brown, about 30-40 minutes. Cool the cake on a rack for about 15 minutes. Remove from the tin and allow to cool completely. Place in a cake plate with a lip to catch the toffee sauce. Pour the warm toffee sauce all over the cake and let the cake sit. The cake will absorb all the sauce. Cut the larger pieces of the crystallised ginger. Scatter over the top of the cake once the toffee sauce is absorbed. Add the sugar, Golden Syrup, and pinch of salt. Let the sugars dissolve and allow the mixture to bubble. Mix until thickened and combined. Allow to cool a little before pouring over cake. I cannot believe 2014 is coming to an end. I have no idea where the year went. It’s been a bit of a roller coaster ride this year and looking back on it, I don’t know how I did what I managed to do this year. In the midst of the craziness we persevere somehow. I’d like to take this opportunity to thank you all; my readers, my friends, my family and fellow bloggers who visit my site regularly and leave such thoughtful comments, I thank you for your friendship and your support and look forward to another year of reading, cooking, baking and friendship! Have a wonderful New Year and I will see you in 2015! I just adore bananas! Thanks for sharing this amazing recipe! It looks very good. I like to eat banana cake. This cake looks fantastic! So delicious! Oh my goodness, this cake has everything going for it. Wishing you and your family a wonderful New Year, Nazneen. Happy new year to you too my dear and I wish you and your readers a year full of joy, happiness, wealth and health. The idea of roasting bananas is so new to me … may be this is the answer to my prayers for making hubby eat banana cakes :). Woow you have 6 bananas in there!!! I would love to try this cake. Your day sounds perfect – I plan on recreating it this weekend 🙂 I spent this holiday with my family in DC while mister worked. Instead of presents, we’re celebrating by treating ourselves to a day of meals and movies. Not doing a ‘traditional’ Christmas has become a bit of a tradition for us too – going to the movie and then hunkering down at home sounds absolutely perfect to me. I’ve just read through your recipe and it sounds as divine as it looks – sweet roasted bananas with toffee sauce. I would kill for a slice of that right now!! This banana cake is seriously making me drool.. I am just LOVING how moist and delicious it looks and all that sweet toffee sauce over the top! Wish I had a slice to devour right now. ¡Buen día! Your Christmas sounds perfect (all except the snow – one thing you and I don’t share is a love of winter!! ), and we can’t wait to see Night at the Museum 3! Maybe tomorrow for us… Our Christmas was quiet – the two of us at home alone, sitting by the fire, nibbling on panettone and sipping cocoa, then moving to an early supper, then a movie and cheese and fruits. A perfect day. Mark has the same aversion to baked banana items that you have – and he also loves them right out of their peels, and in things like banana cream pie. I think he might love this cake and don’t worry – we would never forget the crystallized gingers!! I love banana breads and cakes. I wish I had a slice right now. Christmas Eve was spent with friends and Christmas Day at our Son’s house in Lowery. We too drove home in the thickness of clouds and spitting moisture. At about the time we arrived back in Highlands Ranch, it was snowing sideways. Glad we left early to get home. If banana cake is already delicious, roasted banana cake is to die for… There is only one thing missing here: Me devouring this scrumptious treat! Have a very happy New Year, Nazneen! See ya. 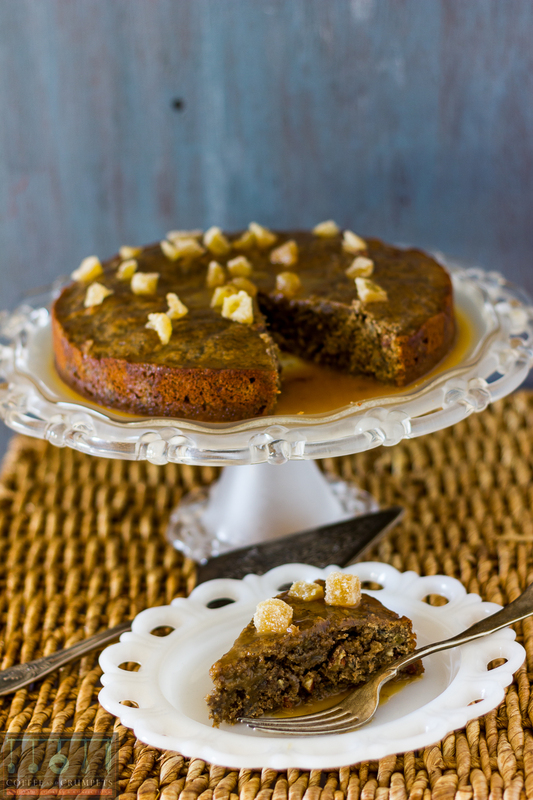 Your banana cake looks really superb with toffee sauce. Continue to enjoy your holidays!